I was almost thinking I should save this post until 2013, early Fall/late Summer when pumpkin mania starts back up again, BUT, I want pumpkin all year long. Who says pumpkin has to be seasonal. It's the perfect vegetable to can and use in canned form, enabling year long enjoyment. One of my favorite ways to eat pumpkin is with chocolate chips which evokes childhood memories of my mom, who never really baked, except for her annual epic batches of pumpkin, walnut, chocolate chip bread from the "Feed Me I'm Yours" paperback cookbook. She'd bake them on Sunday nights and I'd be in hoover mode snatching the fresh-hot goodies first. I made a version of her bread combining mahlepi, an aromatic spice made of ground cherry kernels and fruity extra virgin olive oil. Mahlepi s a common spice in Greek sweets, and the smell that goes off when baking fills the house with a delicious, amaretto aroma. There are many alternative spellings of the spice, in Greece it's known as Mahlepi, but it gets the shout out in wikipedia under "Mahleb." Mahlepi basically unheard of in the US, but that doesn't mean people don't like it. I gave a packet to my boss and he added it to whipped cream which was served on apple and pumpkin pie and recieved plenty'o'hurrays from his crowd for that trick. I would say the best place to find mahleb would be a Mediteranean or Middle Eastern market. 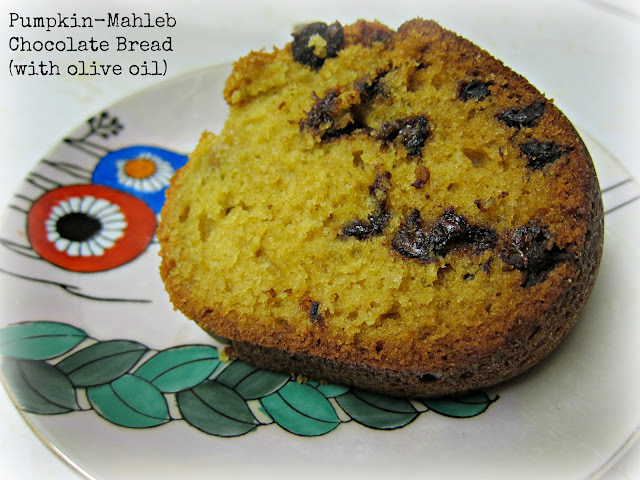 Along with mahleb, I used extra virgin olive oil instead of vegetable oil, which gives off another level of fruitiness. Overall, this was one of the best pumpkin chocolate breads I've ever had and no doubt the best smelling. Preheat oven to 350 degrees. 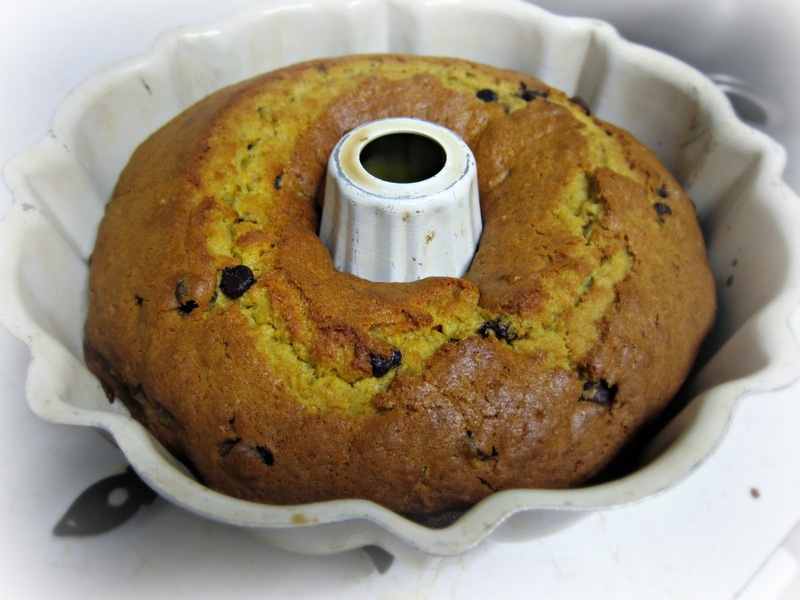 Grease a bundt pan or 2 8"x4" loaf pans. Combine flour, mahlepi, salt and baking soda in a large bowl. In another bowl, mix together eggs, pumpkin, sugar and olive oil. Stir into dry ingredients just until moistened. Fold in chocolate chips. Pour into pan(s) and bake for 45 minutes or until toothpick comes out clean, you know the routine. YUUUUM! I am so interested in Mahlepi! I wonder if I can get it here... I love reading recipes using pumpkins for sweet dishes; here in Australia we mainly have pumpkin as a savoury dish, usually as part of a roast dinner or in soups! Oh my gosh I have never heard of this spice and I am certain I have never seen it in the many Middle Eastern markets around here. (And I've been to a lot.) I just googled it and it sounds incredible Banana Anna! I must find it. Must. And I'm with you on pumpkin. I love it mostly as a savory ingredient and think its good all year round in pastas and even savory breads. I could be persuaded for chocolate chip cookies though. Something sounds so correct about that. Anna - pumpkin, savory style is one of my favorites. Hope you can find mahlepi if you are looking for it - there are tons O' Greeks there in Australia, so they better be stocked up! Trevor - I will hook you up with some as soon as I get some more! There is a huge Greek market in Philly where I'll be heading soon and I'm sure they are stocked. Impressive. Very Interesting article will make sure I check your posts more often! Dan. Stellar. I enjoy you because of Thank you for all of the every one of your effort hard work on this site.. Competitive sports playing games within the past was in fact regarding attaching take risk through the outcomes of horse run. In this connection, thriving this guess will definitely depend upon your personal sportsman that really help the specific obtain a treadmill which can are provided fundamental. Casino moose having is really a well-known online game for many individuals globally.